Members of the Hajim School’s Class of ’16 passed a final test from their departing dean with flying colors at yesterday’s diploma ceremony -- and then were assigned some final homework by the chief benefactor of their school. “Acceleration” the students promptly replied. “Force,” came the equally prompt response. Robert Clark, Dean of the Hajim School, quizzes students on the equation, then presents the t-shirt to Edmund Hajim. With that, Clark presented the t-shirt to Edmund Hajim, whose $30 million gift to the school eight years ago was the largest in University history. Hajim, who stepped down last week as chair of the University Board of Trustees, routinely includes the famous Star Wars quote in his commencement speeches. As life is action and passion, it behooves a person to take part in the action and passion of his time for fear of being judged not to have lived. A person can reach any height if he or she doesn’t mind who gets the credit. There is not a thing more difficult to take in hand than a change in the order of things. There is nothing more exciting either. Growth and comfort are rarely found together. Hajim and Clark, who steps down as Hajim School dean to become the University’s Provost on July 1, were lauded as the two “heroes of the day” by University President Joel Seligman for making possible the “extraordinary progress” of the Hajim School during the last eight years. The school has more than doubled its undergraduate enrollment to more than 1,750. Three-hundred and forty seniors were eligible to receive diplomas yesterday. 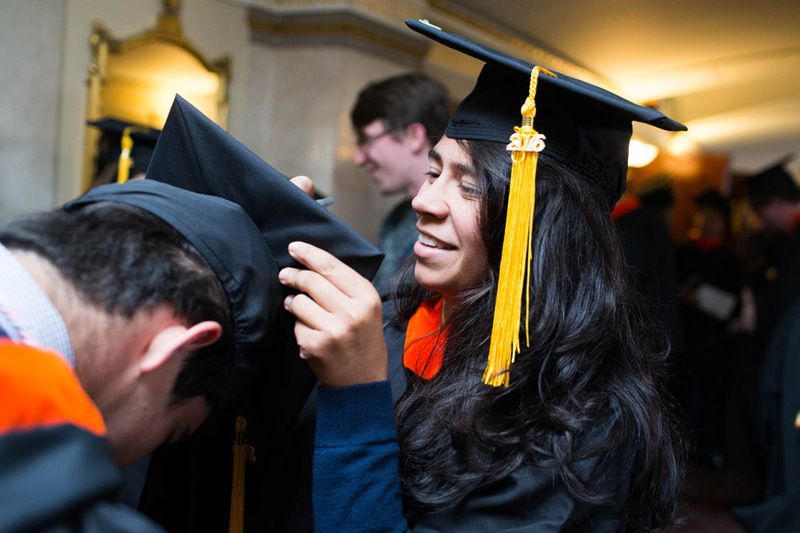 The school has added new programs such as audio and music engineering and a required class in networking skills, put a high priority on study abroad, and recently won a University Meliora Award for its efforts to retain low-income, first generation and underrepresented minority students with its STEM-Gems program. Wendi Heinzelman, currently Dean of Graduate Studies for Arts, Sciences and Engineering, and Professor of Electrical and Computer Engineering, will become the new Dean of the Hajim School on July 1. Find a passion. Find your principles. Find your partners. Find your plans. In addition to honoring students, the diploma ceremony marked the inaugural presentation of the Edmund A. Hajim Outstanding Faculty Award to Nick Vamivakas, Assistant Professor of Quantum Optics and Quantum Physics, and presentation of the Edmund A. Hajim Outstanding Staff Award to Bob Marcotte, the school’s communications project manager. 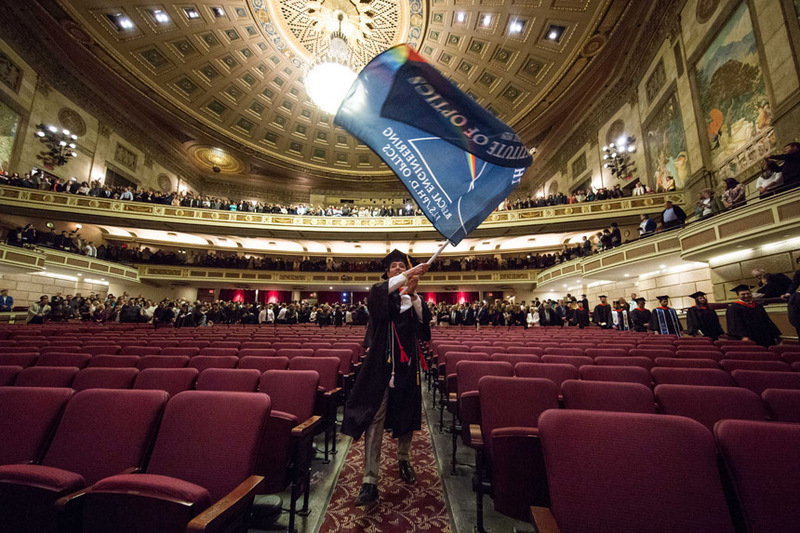 Pedro Vallejo-Ramirez carries the banner of The Institute of Optics as he leads the Class of '16 into Kodak Hall at Eastman Theater.